Conversion of natural land to developed uses may pose the single greatest human threat to native wildlife species in Vermont and globally. Continued human growth and development over the next century will further exacerbate effects of habitat loss and land fragmentation. 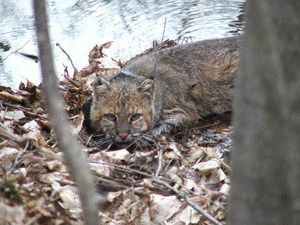 Many wildlife species, such as black bear, bobcat, and fisher, require large land areas to carry out their life cycles. Natural resource managers, tasked with managing wildlife, often have little say in land use decisions. Resource managers and decision makers require techniques for predicting how much and where wildlife habitat is likely to be converted in the future. Researchers from the University of Vermont and Vermont Agency of Natural Resources, with support from the Northeastern States Research Cooperative (NSRC), developed a tool to link development standards in a town with wildlife occurrence. Therese Donovan, Charles Bettigole, and Robert Manning led a survey of 1,505 Vermonters throughout 251 towns to determine residents’ "acceptability" of alternative landscapes with different human population sizes and levels of development in a fictional town. Three-dimensional simulations of landscapes shown to participants varied in amounts of forest cover, agriculture, and development. On average, Vermonters were willing to accept landscapes with 9.1% development, but this varied by town. This estimate is 68% higher than actual levels for development in 2000 (5.4%). Respondents indicated that management action to curb development was appropriate at 9.4% development. Management at local, regional, and state levels was considered acceptable for curbing development while federal level management of development was considered unacceptable. Across towns, this methodology identifies areas that may be at risk of future development, as well as identifying areas where wildlife distribution patterns may face future change as a result of increased human population growth and development. Given a scenario where development levels in towns throughout Vermont depicted “acceptable” levels, Vermont would lose 16,753 km2 in forestland and 1,038 km2 in farmland. Average occupancy rates would decline by 15.9% for black bear and 3.1% for bobcats. Average occupancy rates for fisher would increase by 9.0%. This study provides a method for linking development standards within a town with wildlife occurrence and helps to bring wildlife to the table in local town planning efforts.